The US Patent & Trademark Office published a patent application from Apple today (via PatentlyApple) detailing how a future iPhone could potentially utilize a virtual SIM card that integrates NFC technology. We reported back in October 2010 rumors of Apple experimenting with virtual SIM cards that would essentially allow consumers to bypass carriers when purchasing an iPhone and utilize a carrier-chooser App Store app to select the network of their choosing. Not long after, reports claimed Apple ditched plans due to concerns raised by European carriers who threatened to no longer subsidize the iPhone. Apple’s solution is very complex and unless you’re grounded in this particular field you’re going to get lost. 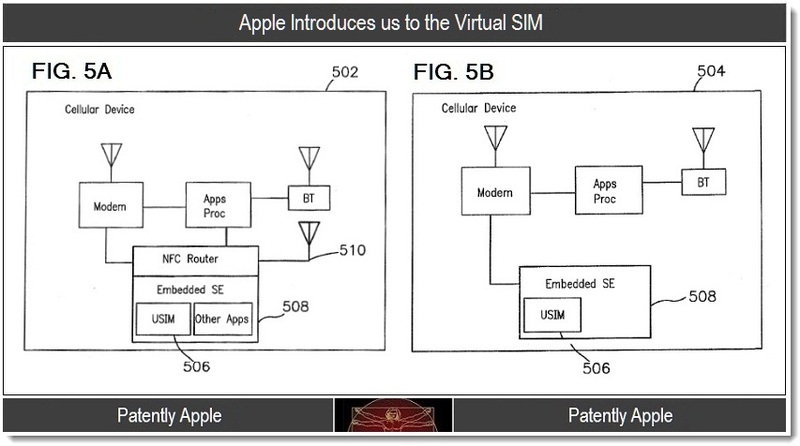 However, while the patent discusses the use of Universal Subscriber Identity Module (USIM)) cards, the real discovery here is that Apple is considering a model of iPhone that may use a next generation Virtual SIM card that includes a NFC Router and tamper-proof security. It’s only in this mode that Apple’s background description of creating a thinner device makes any sense. In Apple’s patent FIGS. 5a and 5b shown below we see two exemplary embodiments of a hardware architecture (502, 504) for a “virtual” Subscriber Identity Modules (SIMs) according to the invention. Unlike prior art solutions, the exemplary embodiments of FIGS. 5a and 5b store a USIM 506 within an embedded Secure Element (SE) 508, which isn’t a removable card. The first illustrated embodiment 502 of the present invention (FIG. 5a) additionally includes a Near Field Communication (NFC) router 510. Two other Apple patent applications were published today, one a “Methods and Apparatus for Preserving Battery Resources in a Mobile Communications Device”, and the other “Systems and Methods for Hot Plug GPU Power Control.” Head over to PatentlyApple for full details.